If you can roll on a skateboard, then you know how to skateboard. Rolling on the streets or skatepark is fun. Its the most basic thing to do on a skateboard. For more advanced skateboarding like tricks there is a method to learn how to skateboard. This article contains guidelines to keep in mind when learning how to skate on this website. Most who want to skate want to do tricks. They want to know how to skate and pop tricks, to do grinds and slides. Many would be pretty happy being able to do few of these tricks and do them well. Things like the ollie, dropping in, some flip tricks some grinds and slides. You can learn all that from this website. Beginner - Just starting to roll and turn. Novice - Can ride well, can ollie and/or drop in. Intermediate - Can do many basic tricks like, kickflip, slides and grinds. Advanced - Can do 3 flips, smiths, feebles, bluntslides, switch. Elite (sponsored, flow) - Does trick combos into and out of things. Pro - Can do pretty much anything on a skateboard. 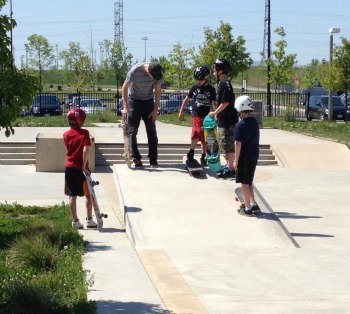 The vast majority of skaters are beginner or novice in their skill level of skateboarding. They are the hidden numbers who skate near their home. Occasionally venturing to the skatepark to see what it is all about. The next largest group is intermediate skaters who want to learn the basic tricks. They want to be able to play in a game of SKATE or ride a ramp with a few tricks to choose from. They are the group most seen at the skatepark. Often a skater will want to do a trick that is too advanced for them. They will see others doing it and want to do it themselves. The drive is there but the basic skills are not. To land the good tricks you need to get your basics down. If a you attempt to drop-in before you have mastered rolling and pumping on a bank or transition. You will fall a lot more. You may take longer to land it than someone who did master those basic skateboard tricks first. You will fall on your head way more. Who wants that? If you try to backside flip without learning the kickflip or backside 180. You are less likely to land the trick. Not having built the balance needed to follow through on the trick, even if you get the flip and body rotation you will most likely land on the board and fly off to the ground. Learning in the right order will be safer for you and a lot more fun. This is because you will pick up new tricks much faster. By breaking the skateboard tricks down into steps. Getting your basics solid first and using a consistent method, you will learn how to skateboard faster. That is how I learned and that is how I teach.